Soba noodles are roughly as thick as spaghetti and are usually made of buckwheat flour. They can be prepared either as a hot or a cold dish and are very popular which make them readily available across Japan. Soba dishes are eaten throughout the year but there are a few that are consumed only on special occasions such as New Year’s Eve. They can be bought dried in supermarkets but the ideal way of having soba is from freshly made noodles. Hot soba is usually served in a soup and are eaten with chopsticks. Slurping the noodles is said to enhance the flavor and helps with cooling them as they are eaten. The broth is drunk straight from the bowl and it is not considered rude if there is unfinished soup at meal’s end. 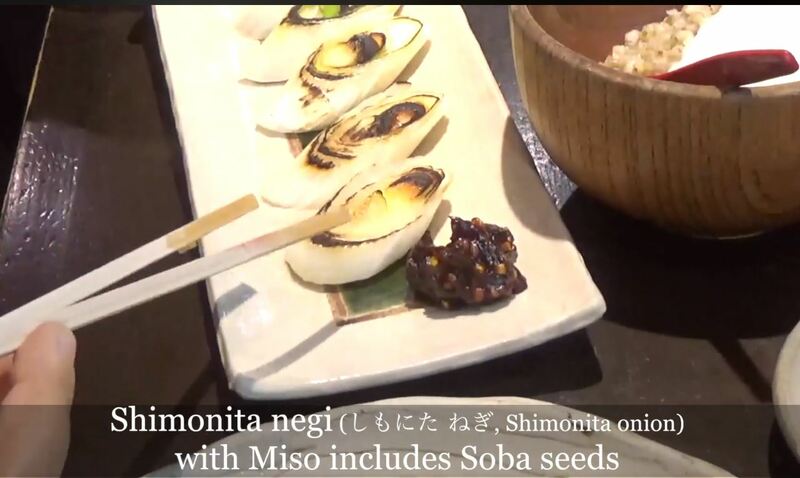 Cold soba Is served with a dipping sauce and are accompanied by garnishing like green onions and wasabi which can be added to the sauce depending on preference. The noodles are then picked up by the chopsticks and dipped in the sauce before eating. A few soba restaurants will provide hot cloudy water served in a small teapot. This is sobayu, the water that the soba noodles were cooked in. 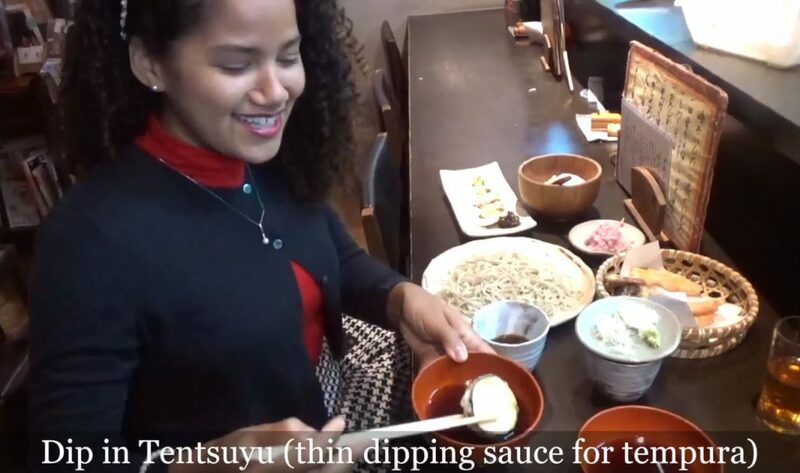 It is meant to be infused with the remaining dipping sauce for drinking once all the noodles are consumed. Buckwheat noodles are high in protein and contain various types of amino acids, such as lysine and arginine which are essential building blocks for child development, growth and stamina. These nutrients are natural and healthy additions to one’s diet. They are not only excellent for mental and digestive health, but they are also believed by many to have properties that prevent disease. Buckwheat contains more vitamin B1 than white rice. Vitamin B1 is important for strength and a healthy appetite. Buckwheat also contains more vitamin B2, which is beneficial for the skin and helps prevent ailments like canker sores. Vitamin E is also present, which is good for anti-aging. Then there’s choline, which prevents cancer and liver diseases, and polyphenols, which helps prevent the death of memory cells to reduce the risk of dementia or going senile. Toshikoshi Soba: Why do Japanese Eat Soba on New Year’s Eve? Toshikoshi soba is a unique New Year’s custom in Japan’s, and these buckwheat noodles are enjoyed on New Year’s Eve. 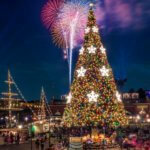 The tradition dates back around 800 years, to the Kamakura period, and it is believed that it all started at one Buddhist temple that gave soba to poor people on New Year’s. It was in the Edo period that these New Year’s noodles, or toshikoshi soba, eventually turned into a fixed custom done by people all over Japan – even today. 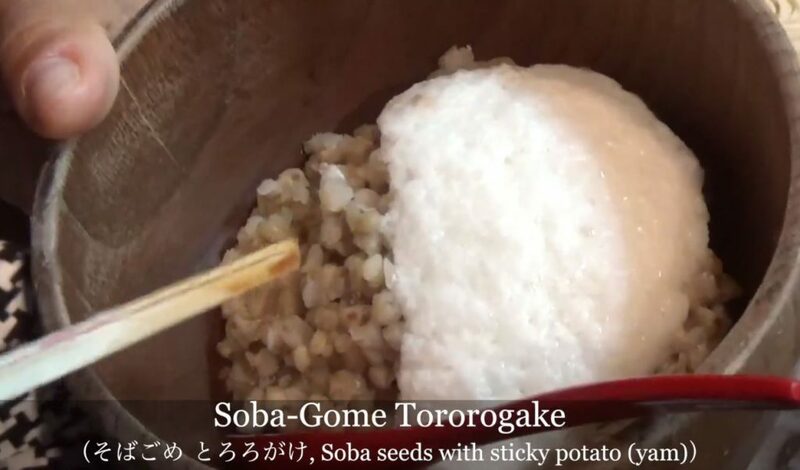 It is said that soba is supposed to signify strength and resiliency, since the buckwheat plant itself bounces back even after being flattened by wind and rain. Other people say that the long, thin shape of the noodles signify the wish for a long life while some believe that soba noodles can signify the clean breaking off or ending of the old year. Another belief of toshikoshi soba is based on the fact that fine soba flour was once used by goldsmiths and gilders to gather up leftover gold dust and because of this, soba became associated with gold, and therefore good fortune. Soba noodles are used in occasions too. In the Kanto region, new arrivals to a neighborhood are still greeted with a gift of soba, called hikkoshi soba (moving-in soba). Some businesses used to repeat the eating of soba noodles around the time of Setsubun (Bean-Throwing Festival) in early February, to really ensure that the upcoming year will be a good one. However, eating toshikoshi soba on New Year’s Eve is by far the most enduring soba tradition. We visited Taku Restaurant located 5 minutes on foot from Motomachi Station in Kobe City. There are only a few soba restaurants serving Hand-made Soba whereas majority are machine made. Hand-made soba is fresh and has more fragrant of soba seeds. The Taku restaurant uses 100% of soba seeds whereas majority are mixed with wheat flour. We experienced watching how soba noodles is made from grinding soba seeds then adding water to the soba seed powder then mixing and kneading. 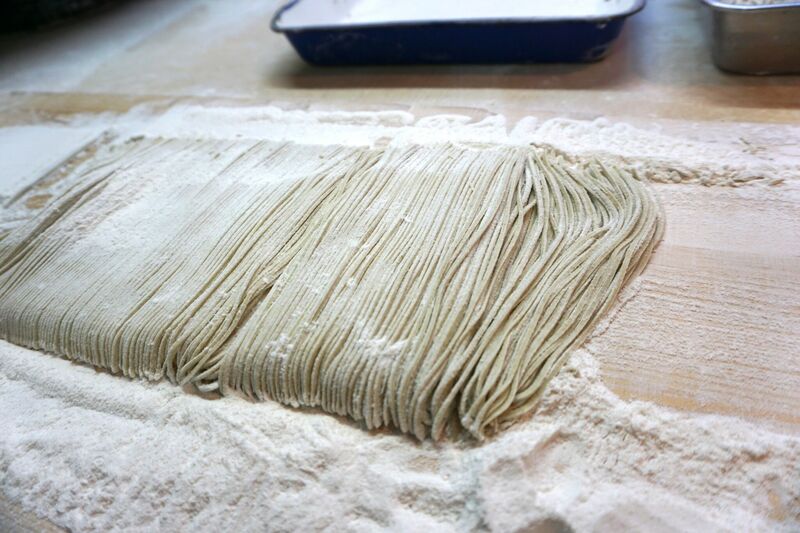 Afterwards, it is flattened and folded before being chopped into thin noodle strips. The noodles are then boiled, rinsed and ready to serve. The time we visited (early Dec.) was a new soba season, and the soba’s color was beautiful light green. 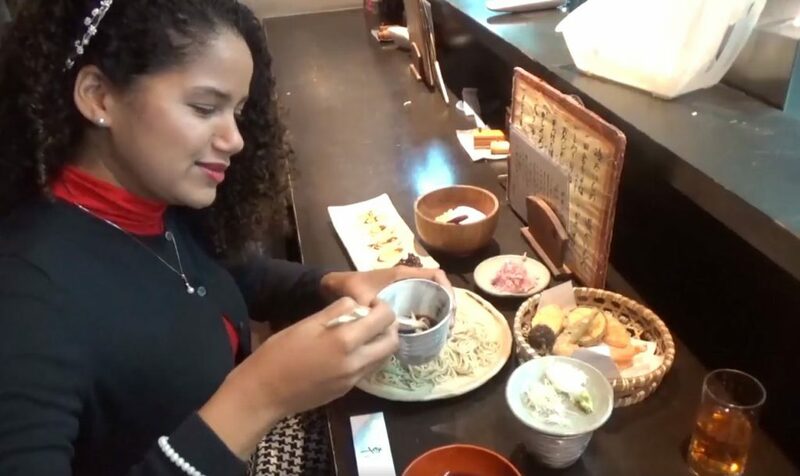 Check out our video where our host, Epi, teaches us how to eat Soba. 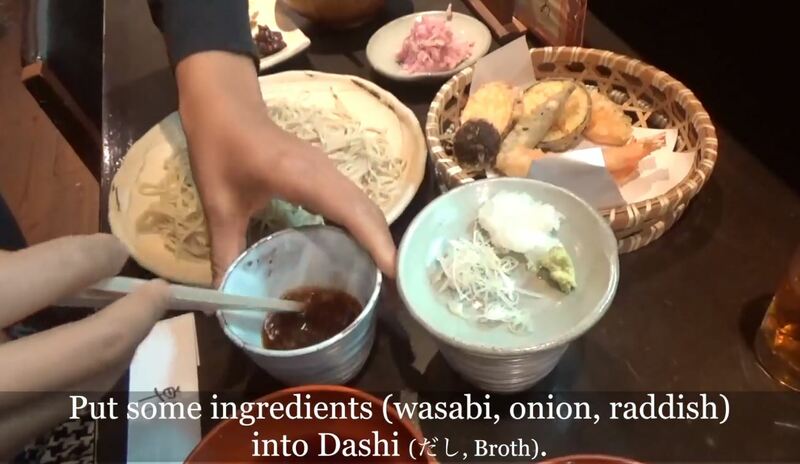 First, she mixes all the different ingredients including wasabi, onions, radish and the dashi broth. She grabbed a few strands of Soba noodles and dipped it into the sauce. 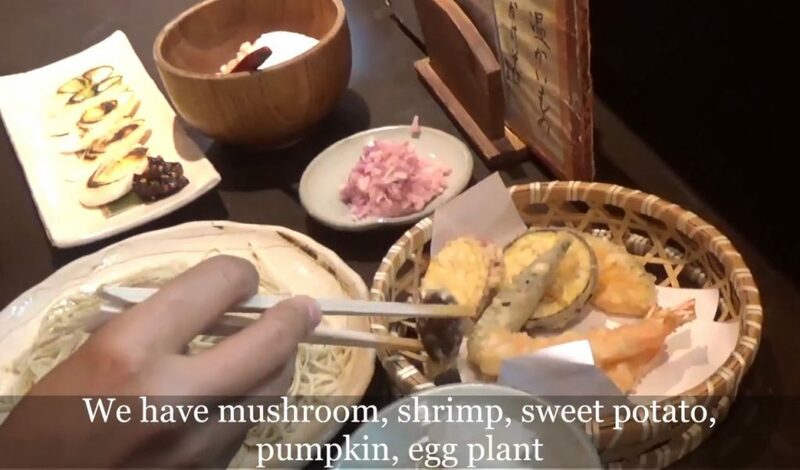 She also enjoyed tempura dishes such as mushroom, shrimp, sweet potato, pumpkin and eggplant. The tempura is dipped in Tenstsuya which is the sauce for tempura dishes. 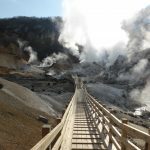 We interviewed the owner, Taku-san, about his special restaurant. Taku-san shared that his grandfather has owned a Soba restaurant and he has loved Soba since childhood. When he turned 20 he decided to put up his own restaurant. He is proud of how his restaurant gives importance to the Soba making process from the grinding, kneading, to parboiling. He encourages foreigners not to be intimidated by Soba restaurants. They are casual places that is actually considered “fast food” in Japan. 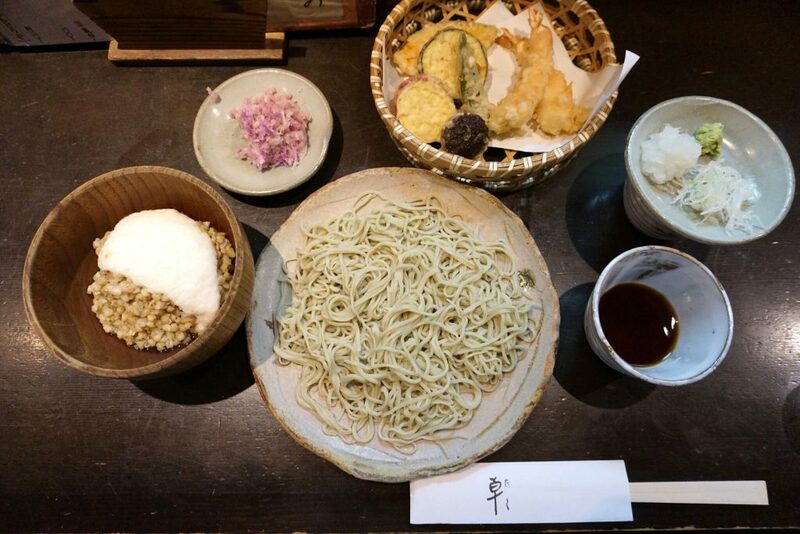 He invites everyone to come and try out handmade Soba at Taku restaurant. We are now offering square-shaped Hanko stamps. Ideal for artwork, Karate dōjō and company seal. Contact us to order your own customized Hanko seal.